Direct - Faster & Better! 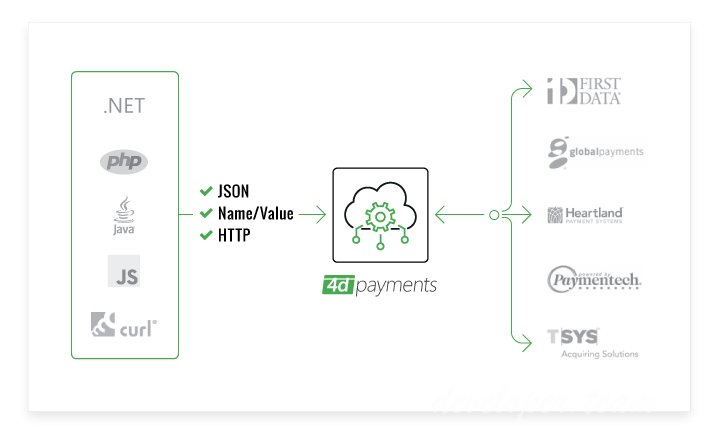 Direct processing with every major Internet processor including FDMS, Paymentech, Global Payments, Heartland and TSYS. Native editions available targeting major platforms & IDEвЂ™s including: .NET, ActiveX, ASP, Delphi, C++, etc. 3-D Secure MPI integration support, Verified by Visa, MasterCard SecureCode, and JCB J-Secure. Fast and Lightweight, No External Dependencies, Transaction Logging, Integrated into Major IDEs, and more! Today's broadband always-on Internet connections are vastly superior to dialup links, providing virtually instantaneous authorizations, error-free connections, and greater security. Properties for 3-D Secure MPI integration (CAVV, ECI, and XID) for Verified by Visa, MasterCard SecureCode, and JCB J-Secure support. Logging features including raw transaction details for troubleshooting and storage.